Chinese migrants have played a big role in the population of Australia. By 1878 the Chinese population in Darwin outnumbered the European. The Government of the day contracted ‘coolies’ to work in the goldfields and the building of railway lines. They were cheap labour at the time. Discriminated against by the locals, they were forbidden by law to cross the border from the NT to SA unless they paid a ten pound entry tax. This is a description from 1897: “Chinese, who are ready and willing to work night or day and seven days a week, have ousted Europeans from many branches of trade. Hairdressing, tailoring and bootmaking are all done by them….The chefs are invariably Chinamen; this applies to most of the Northern Territory.” Their involvement in the life of the NT continued to grow and strengthen. Today they are a respected and important part of the culture and life of the NT. 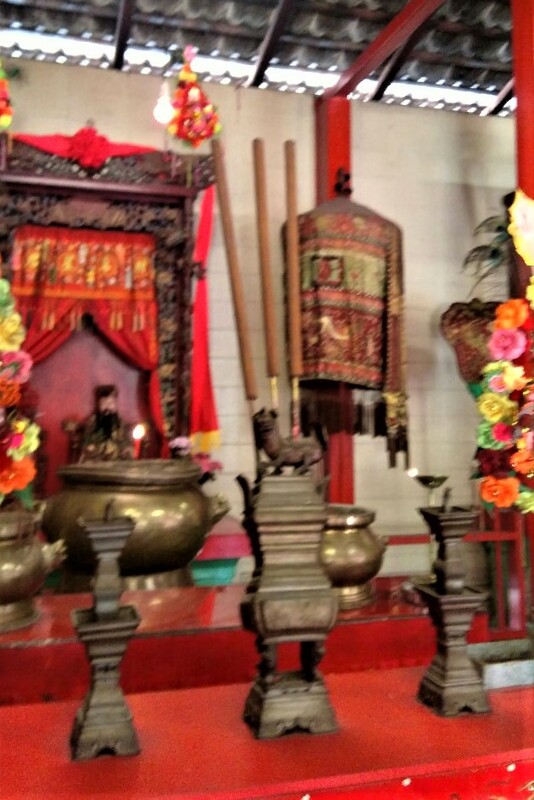 We visited the Chung Wah Chinese Temple in the CBD. Resting atop a hill it overlooks the city. Stepping in through the doors took us into a quiet space of peace and serenity. 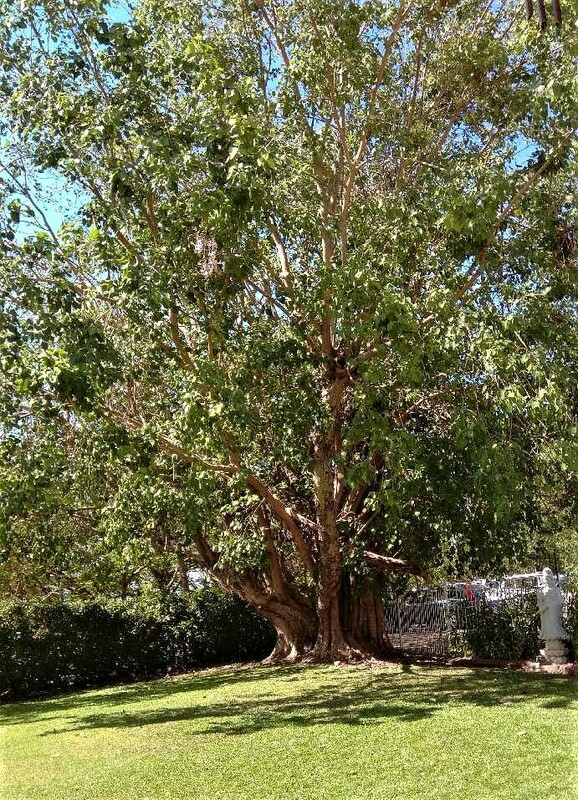 The sacred tree in the grounds is rumoured to be a direct descendant from the Bodhi tree under which Buddha sat when he attained enlightenment. Inside the temple visitors were invited to purchase a $2 bundle of incense sticks. I did. Lighting three at a time I slowly walked around the interior placing burning incense sticks into the provided urns. It felt good to be honouring the customs and traditions of our Chinese population. The temple has a long history having first been erected in the 1880’s. It has been battered by cyclones and damaged by lootings during the war years. 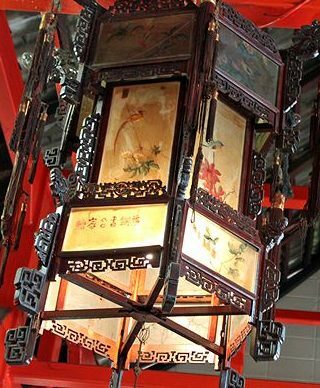 The furnishings of the Temple consist of a main and two side altars, each laid with embroidery in which dragons are prominent, ceremonial bell and drum, pennants and banners. There are two oblong shaped openings in the roof, known as heavenly wells. It is believed that when God visits the Temple he comes through those openings and not through the door. 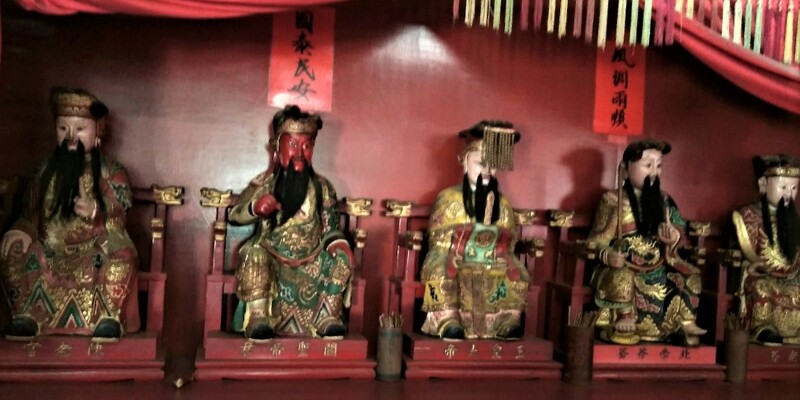 On the central altar are five statues, the central figure representing Almighty God, whom the Chinese believe to be the same God for everybody, Chinese or otherwise. This central statue wears a head-dress with pearls suspended in front, symbolising his status, not unlike the crown worn by a monarch. The wooden plaque represents four Saints, great healers and master craftsmen. To the right is the altar of Kwan Yin, Goddess of Mercy whilst on the left is the Saint of Fortune and Prosperity. On the front altar are two dragons with a plaque in between with the inscription “Wing Bor Ping On’, meaning ‘Everlasting Heavenly blessing and protection’. 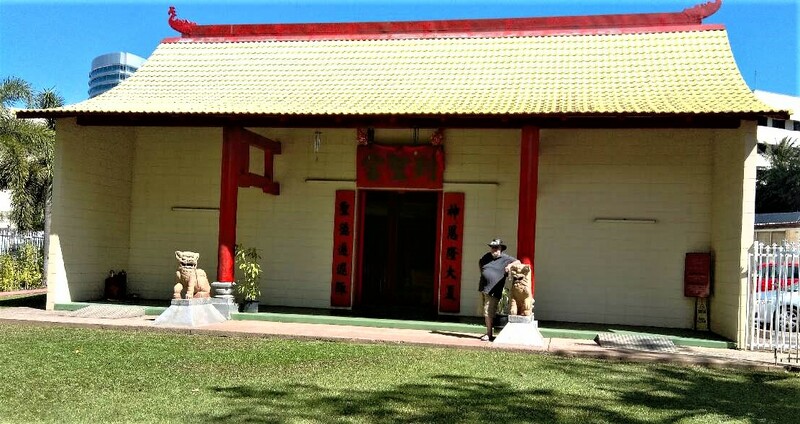 I’ve seen Chinese temples all over the world but I did not know there was one in Darwin! There is so much more to this, of course. The Chinese have had a profound influence in Australia, particularly in the goldfields across the nation. lovely pictures from the temple and nice story. It was very peaceful in there.